Time travelers may remember when the Old Post Office Building on Pennsylvania Avenue offered a cacophony of noise, bad food court smells and sweaty tourists. That changed in 2016, when the historic building was transformed into the Trump International Hotel. Today, the large, serene atrium lobby is awash in shades of cream and blue, with light bouncing off hundreds of crystal decanters — making it the perfect place to enjoy lunch. BLT Prime by David Burke, one of the celebrity chef’s trademark eateries, offers an eagle’s view of the atrium lobby, where splashes of bright red (courtesy of MAGA hats) interrupt the pale color palette. The draw to the Pennsylvania Avenue address was the promise of the best steak sandwich — ever. Big words. Honestly, a steak sandwich is not high on this food fan’s list. First and foremost, the bread is often too thick, too chewy, too crispy — making it impossible to bite through the sandwich. Not so at BLT Prime. A ½-inch thick filet is grilled perfectly, seared with a lovely red-to-pink center at medium rare. The sear caramelizes the exterior, protecting the moistness and flavor inside. Unfortunately, a steak sandwich is too often done wrong. When properly grilled, steak will retain its fat molecules, where the flavor lies. Properly grilled, the meat stays juicy, allowing the sandwich to be eaten as a sandwich should be — bite by savory bite. Cooked well, even medium well, and the interior heats to high, bursting those pockets of fat. The result is always a drier, less flavorful bite. 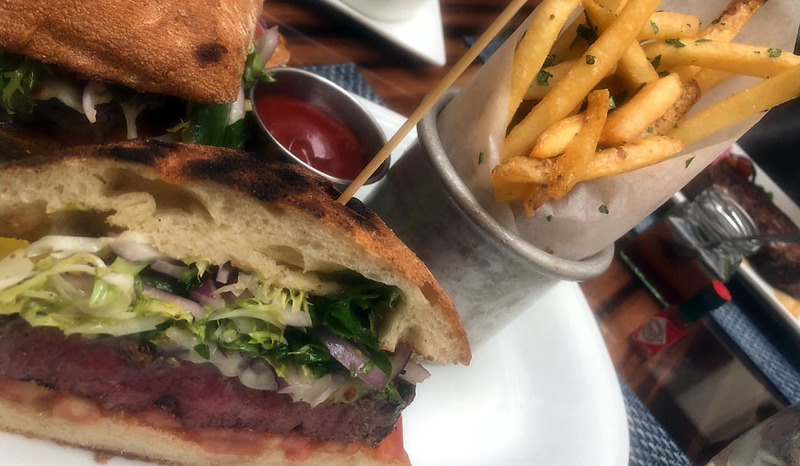 Most important, when the steak is set on a fresh ciabatta roll that absorbs the creamed Vermont cheddar, you can bite through the sandwich without the toppings — a blend of chicory-rich frisée lettuce, watercress and red onions — landing on your lap. Also on the BLT Prime menu is the cowboy steak. Usually reserved for two, this lunch cut of prime rib is perfect for one very hearty appetite. Its rich, full-bodied flavor is what a steakhouse is all about. Eaters can choose from a variety of sauces, including Bearnaise, au poivre, red wine, chimichurri and traditional horseradish crema. When it comes to creamy goodness, look to the Top Hats menu that includes a lobster fondue, garlicky shrimp, or blue cheese and caramelized onion. Personal recommendation, choose the blue cheese and caramelized onion: A marvelous, creamy blue cheese is broiled with onions until caramelized and yummy. That blue cheese perfection is the perfect dip for the crisp house chips, served with the tuna-avocado tower or the crisp, salty, truffle French fries. Not everything at this modern steakhouse is beef. Lunch begins with the BLT Prime Gruyere cheese popovers, served warm with unsalted butter and a tiny milk canister of sea salt. Brown on the outside, buttery yellow on the inside — eat them while they are still warm. Starters include a tuna tartar and avocado tower with a soy lime dressing. At BLT Prime, chefs understand avocado and how to present it for optimal flavor. Here, as you bite through the sweet, fresh tuna to the avocado, you get just a hint of warmth, courtesy of the wasabi that lies beneath every bit. 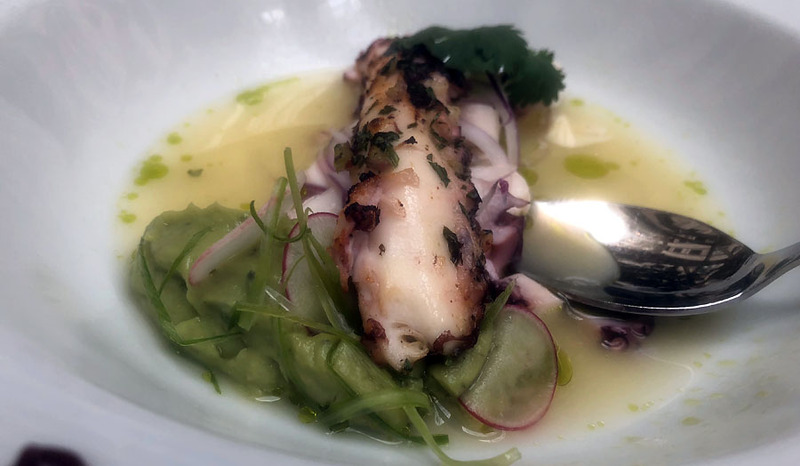 A grilled octopus is served tiradito style, meaning that while it is grilled with finely diced onions and parsley, the meat is neither rubbery nor dry — two all-too-common outcomes. Instead, it is firm and sweet, served atop a tiradito- or ceviche-style leche de tigre (tiger’s milk), a Peruvian citrus-based marinade. In that marinade taste lime and ginger juice, white soy infused with green onion and dressing over the thinnest radish, parsley, and green spring mix. The dish is pushed to excellence by the surprising avocado and mint puree. Yes, avocado and mint, which must be a happy mistake, like chocolate and peanut butter. With the vinegar in the dressing and the fresh garnish, the creamy, rich avocado is surprising and delicious. Sides include standards such as mac and cheese and steamed broccoli with sweet chili. Sitting along the railing, just under the girders that support the atrium and from which crystal chandeliers dangle, one can appreciate the views of the large lobby and bar. The creams and blues of the lobby, along with the Trump signature gold accents, carry over into the hotel’s guest rooms. The overall effect is one of serenity. And the lobby, despite its carnivorous size, is oddly quiet, allowing for conversation without the hint of an echo.